Siril Varma is a young Indian shuttler who happens to be the former BWF World Junior No.1. He was also a part of the Hyderabad Hunters in the Premier Badminton League and the champion of the All India Senior Rankings Tournament 2018. In an exclusive interview with Sportskeeda, Siril talks about his entire badminton career and his experience with Pullela Gopichand. How does it feel to have claimed the No.1 rank in the BWF Junior Rankings? Siril: First of all I felt very happy to be BWF Junior World No.1. It is a dream come true, I achieved this due to the guidance and blessings of my guru Pullela Gopichand. I always wanted to see India on top of world badminton and this is one of my contributions towards it. What inspired you to choose badminton as your career? Siril: My coach guru and mentor Pullela Gopichand was the reason why I got into badminton. His passion towards badminton inspired me. Gopichand Academy has changed the fortunes of various young players. What has been your experience with them? Siril: I feel very fortunate to have started my career in badminton in the Pullela Gopichand badminton academy at the age of 8. It is the guidance of my guru and mentor Gopichand that made me become junior world no.1. Gopichand academy has world-class infrastructure. I am very thankful to my coaches, physios and senior players. I am very fortunate to be in midst of great players like Saina Nehwal, Parupalli Kashyap, Guru Sai Dutt, Kidambi Srikanth, PV Sindhu, Sai Praneeth etc. Their suggestions and support have helped me a lot in improving my game. You were the first Indian player to win the Badminton Asia Youth Championship. How did it feel when you claimed the title? Siril: I was very happy to achieve such a feat. It pushed me to work harder and harder for my country. All the credit goes to my coaches, physios and trainers especially Gopi & Anna. They were the pillars of my success. Do you consider your silver medal in the World Junior Championships as your greatest feat? Siril: It was one of my greatest achievements, but there is a lot more to achieve. I want to make India a superpower in the world of Badminton. You were a part of Hyderabad Hunters in the Premier Badminton League. What was your experience with the world-class players out there? Siril: I was very fortunate to be a part of Hyderabad Hunters at a young age. I was given a chance to interact and get trained with world-class players like Lee Chong Wei. He motivated me and shared his experiences. His experiences helped me to improve my game. Hyderabad Hunters is a professional league team. They encouraged me and gave me an opportunity to be associated with world-class players. 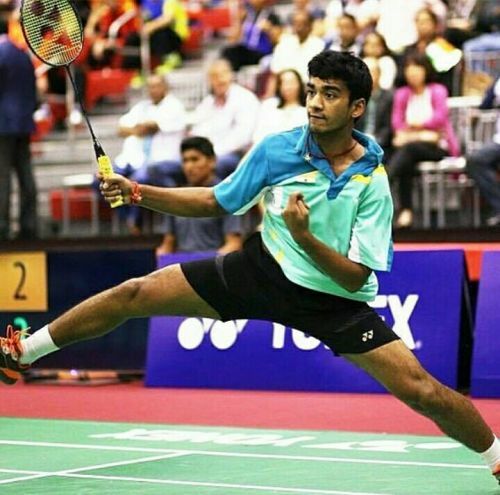 You've been considered as the future of Indian badminton. How do you look at these comments? Siril: I feel very proud when I hear these comments. Every time I hear these comments it reminds me of the responsibility to work harder and harder to achieve more and more for my country.